Life.Changing. That is all I can say! 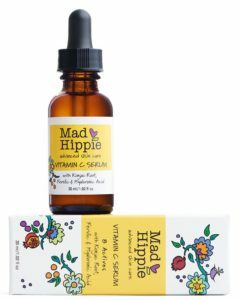 Coming from a girl who has extremely sensitive combination skin and who rarely uses any products on her skin… I honestly cant miss a day without applying my new absolute favourite, the Mad Hippie Vitamin C Serum! I’ve been going along quite happily only applying a tiny dab of eye cream on at night, I don’t have terrible skin naturally, but it is by no means nice. I used to have acne so I have some scaring, my pores are a bit too big for my liking, I’m starting to get fine lines, and I’ve definitely never felt comfortable leaving the house without makeup on. I thought that was just the way it was for me. You cant really change your skin, right? WRONG. Yes, you can, and I did. The Mad Hippie Vitamin C Serum completely changed my complexion! My pores appear smaller, my skin feels nice and tot, and I actually feel like I’m glowing! (but maybe the glow is just from being so happy about the rest of it?!). I have gone my entire life never feeling good about my skin and definitely never getting complimented on it. Since I’ve started using this Vitamin C Serum I get compliments left, right and centre on my skin. It’s like my new best feature. It’s actually mind blowing. The reason I decided to give the Vitamin C Serum a go was actually from a Dermatologist appointment I went to with my mom years ago. They were going over everything you should be applying to your skin and how to properly care for it and one thing that was stressed by the doctor was how absolutely amazing Vitamin C Serums (the right ones) are for your skin. My skin has always done better with as little products as possible so I never really looked into finding “the right one”. It just seemed like a lot of work and by my past experiences… probably very little to no return. Boutique Esthetics Lounge opened, my paradise, and I began researching all of our products. I instantly fell in love with Mad Hippie because it’s all natural. It’s really incredible. They believe all of their products should provide two simple things, safety and efficiency. And they stand true to that! My Vitamin C Serum contains a whopping 8 active ingredients!! Most products in this segment only contain 1-2 active ingredients! And for all my fellow animal lovers, you’ll be happy to know this line is vegan, no animal testing is done, and all print on the packaging is done with soy inks with 100% wind energy. Not to mention GMO free. This is also a Victoria Secret Models favourite product! So yeah, you can be a total bombshell and still use a completely natural product! I wish I had a before photo of my skin to show you what a difference it has made. 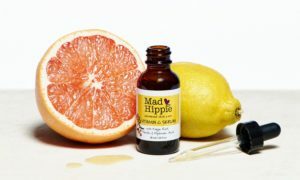 You can take a look at Mad Hippie’s website Before and After page and see for yourself what the Mad Hippie Vitamin C Serum has done for other people! The proof is in the puddin’!